Why did I make this proof? ...means they get less likely all the time. Buy a mug or shirt with the proof! This is the reason that faith is bad. Faith is the assumption of truth when evidence is absent. This absence of evidence is evidence of absence of truth. So faith in itself is evidence of falseness. Therefore, faith is not a road to truth, but instead a road to falseness. Blindly following orders is also bad. The absence of a good reason for an order is evidence that the order is bad, since absence of good is bad. 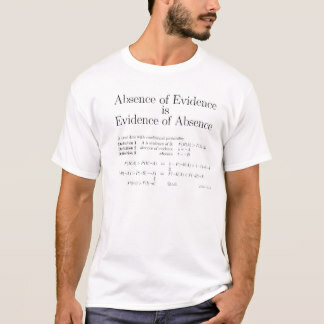 Carl Sagan is often quoted as saying "Absence of evidence is not evidence of absence", but he meant it as an example of what fools mean, and has since been consistently misquoted as something he meant. Absence of sign/indication is a sign/indication of absence. More serious is the American Statistical Association, who even sells a T-shirt with the wrong slogan on it. Being statisticians, they really should know better. Considering the large number of members who could have pointed out this error, it is rather telling that it is still there. There was a previous version of this proof, but this new one is much shorter, simpler, and it also defines the concept of evidence, which is also very useful and absolutely necessary to understand what the proof is about, which many never did understand. 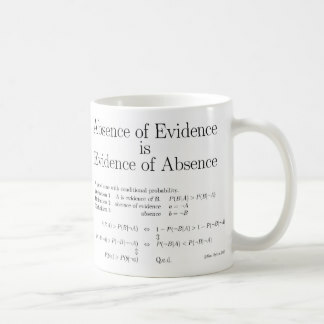 I have seen that the comprehension of this "absence of evidence" concept is one of the main differences between sensible and gullible people. Gullible people will not and cannot understand this concept. More women than men wear skirts. Both women and men can use trousers instead of skirts. Skirts for men are kalled kilts, and are usual in Scotland. there are more women than men wearing skirts. then it is more likely a man. 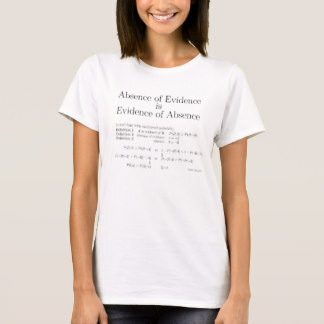 A Jehovas witness rang on my door, and I heard her coming, so I got my "Absence of Evidence" shirt on just in time to greet her. This Jehovas witless was typical, babbling incoherently about Bible stuff. So I gently steered her toward evidence and proof, which turned out to be surprisingly easy, and she babbled happily away about biblical proof and the faith's proof for a while. So I said to her "You do not know of what you speak, since you would not even recognize a proof if it was right in front of your nose! ", while i put my chest closer to her face and pointed to the proof there. She looked at me as if I were a devil, clammed shut, and went away with an arrogantly superior and offended expression. So I was obviously completely right about her. "Suppose you are a programmer, and you are looking for bugs in a program. At first you cannot sleep at night because you are convinced that there must be a bug somewhere, you just haven't found it yet. To find the bug, you test the program to see if you find something that doesn't work as you expected. If you found something, it would be evidence that there was a bug. If you test the program a lot, and still find no evidence of a bug, this increases your confidence that there is no bug. In other words, it counts as evidence for the absence of a bug, and you are finally able to sleep better. After a while, your program is thoroughly tested, and you still find no evidence for a bug. You begin to suspect that there might not be a bug after all. However, if there is no bug, you will have no purpose as a programmer. You feel as if your life depends on the existence of a bug. You are now looking for the Bug that will save you. You believe that there must be a Bug, so you test your program even more thoroughly. When you still cannot find any evidence for a Bug, you start to rationalize: Although I cannot find any Bug, that does not prove that there is no Bug. You are now a true believer in the Bug." PS: A nice comment, in Spanish. PS: A nice article, with pretty pictures.